Where would summer be without zinnias? As sure as the dialogue between katydids marks the hours, as sure as the sweat dribbles from my forehead as I pull the weeds, zinnias are the synthesis of summer. You might veer for lemonade stands, but I brake for the card tables jammed with zinnias stuffed in coffee cans. Doesn’t matter that I’m growing my own. The fact that I’ve got fistfuls wading in the feathery asparagus doesn’t stop me from skidding to a stop whenever I see a display of flower-filled Mason jars as I whiz by and plunking down my money in the Honor System jar. You can never have enough zinnias in life. Zinnias are whoppie. Zinnias are hubba hubba. 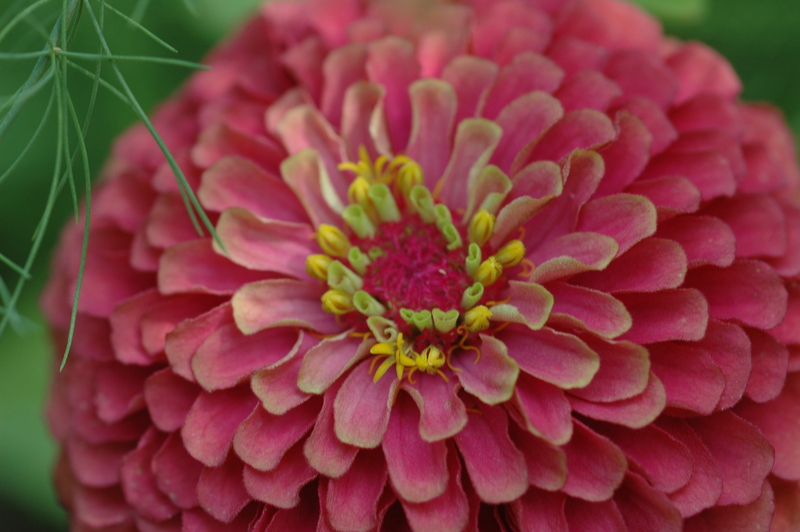 Zinnias are the tarts of summer. And no garden is complete without zinnias. So that’s what this post is all about — getting you up to speed with a summer essential. I started with zinnias (‘Cut and Come Again’ if I recall) not long after my Brownie marigold project. Graduated to the Oklahoma series when it was available in separate named colors. From there, I moved up to the Benary strains. The only zinnias that were complete unrequited love were the cactus types. Total fizzle on them (advice? recommendations?). Otherwise, we’ve had a pretty good relationship over the years. Purples have always made my heart flutter. And the reds. Not to mention the whites. But now a new zinnia has stumbled upon my scene, and I’m smitten. ‘Queen Red Lime’ cross-dresses. It’s a chameleon colorwise. By red, they really mean dusky rose — a sort of smoky shade of burnt pink. Depending upon when you catch it during its phases, its dome-like heads evolve from rose on the outer petals to green toward the center. The percentage of doubles is impressive (I didn’t hit any singles whatsoever in my seed packet) and the plants have endured the drought with a stiff upper lip. In other words, ‘Queen Red Lime’ makes other zinnias look like shirkers. I got my packet from Territorial Seed (www.territorialseed.com).Great germination. 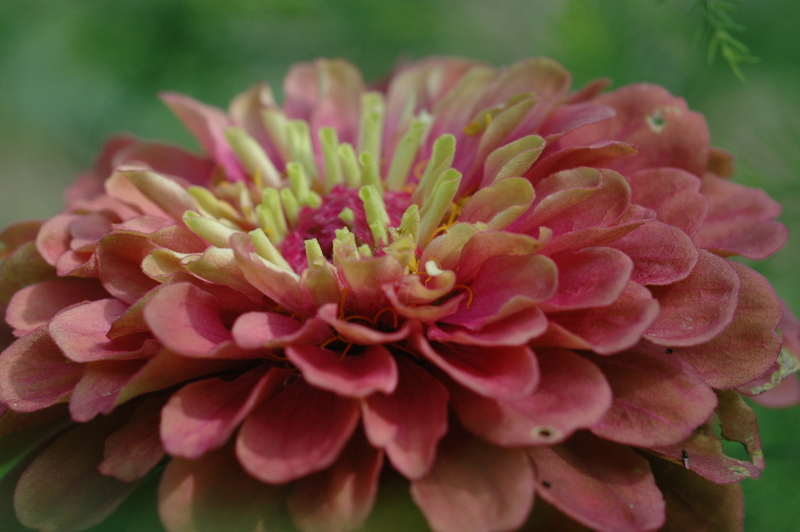 Long ago, a cut flower-growing friend clued me into the winning formula for zinnias. Water early in the season to give the plants a strong start and then keep the foliage dry to prevent diseases. Well, this summer, keeping ‘Queen Red Lime’ watered would have been a fulltime job (I have wimpy water pressure down in that garden). Still, the plants soldiered on and produced their 3 inch (and up) flowers on long stems (don’t you hate to sacrifice buds for the sake of a long stem in the vase?). 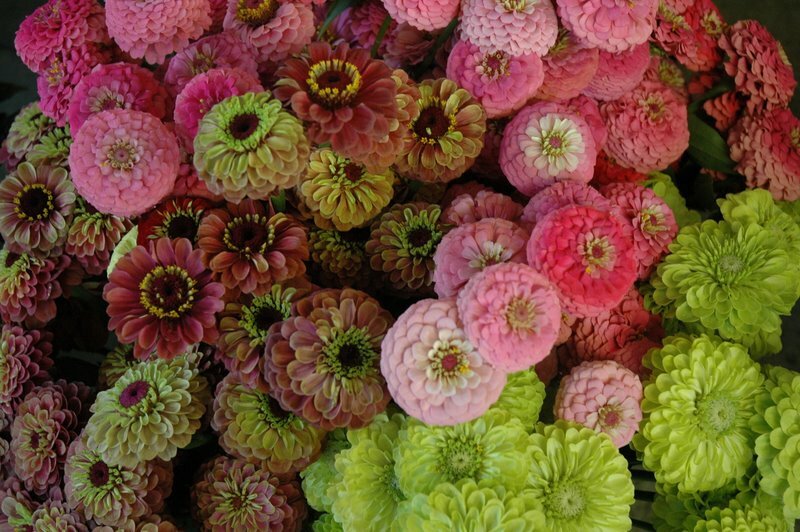 They’re sturdy, they’re colorful, and they bunch up into a great bouquet, especially if you want to sprinkle in some green ‘Envy’ zinnias alongside. This entry was posted in Cut Flowers. Bookmark the permalink. you are making me pout with this posting as I gave up my cutting garden to let my youngest daughter plant corn in it. 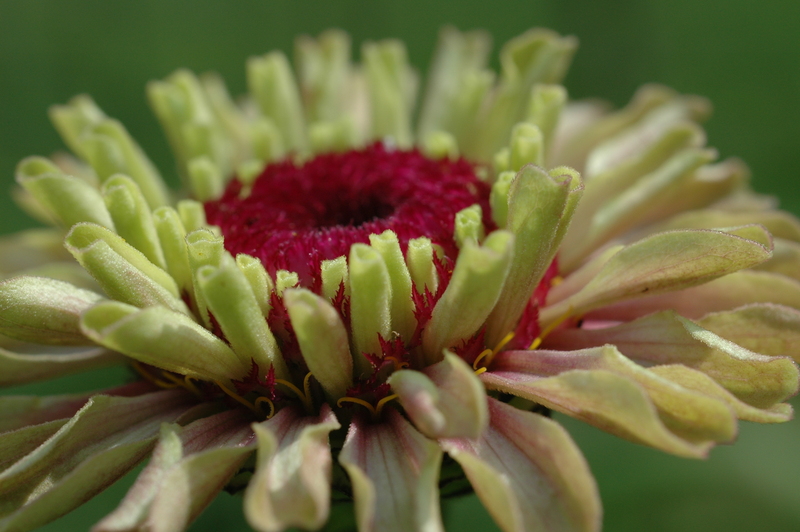 This will be my first zinnia free year since I started gardening. Up until now I have collected as many seeds as I could get my hands on, and always ‘Envy’ in the bunch. I have never grown ‘Queen Red Lime’ ..it is surely a stunner. Next year no matter what zinnias are back! Tovah~ Linden Hill Terrarium workshop is Sunday, October 2~ unless you’re going to be there another time I’m not aware of. Oops. Right you are. We went over the October line on this = I’m going to be at Linden Hill in Ottsville, PA on Oct 2nd everyone. For more terrarium workshops and lecture appearances (I do lectures on several topics) go to http://www.tovahmartin.com one and all. 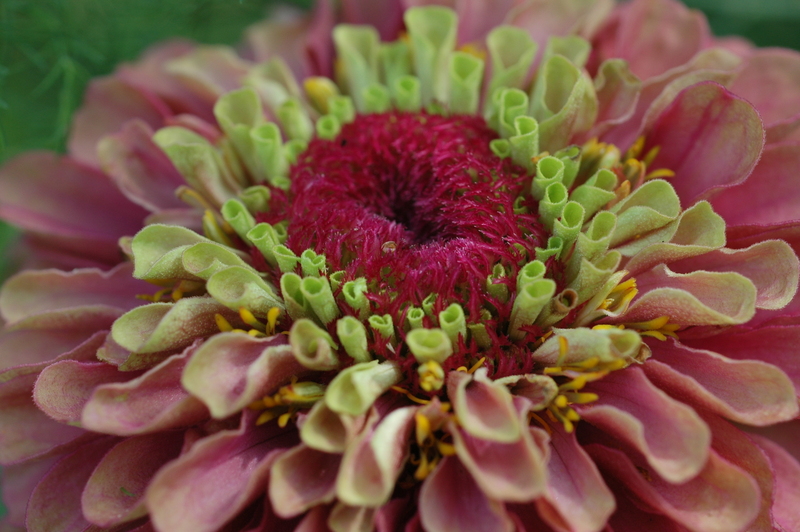 Tovah, this is one stunning variety of zinnia. It’s a lighter version of the palette of my hellebores so it immediately resonated with me… I really must find a way to use these! Hey Cathy, I really love this flower and I notice that it was featured as an up and coming newbie in Horticulture magazine’s list of must-haves for the coming year. It’s no longer hard to find. And it survived the trials of this year’s rain, rain, and more rain with no foliar spotting. How are you doing after the storm? I still don’t have power 7 days later = a kind friend who just got power let me use her spare room to log on today. And you?